I got a lot of questions on what to trade during Brexit. So here is the article you have been waiting for. First a small note – What is Brexit? Brexit word is derived from “Britain” and “exit“. After the World War II in 1975 there was a voting in Britain (United Kingdom) to enter the European Union or not. 67% of people voted “Yes”, means they wanted to join the European Union. After that we all know that Britain has gone through a lot of development and changes. So a lot of political parties and people there want to leave the European Union. Because Britain has to pay £350 million – that is about $440 million – per week to the European Union. A lot of money about 50% of it comes back in the form of aid, but the problem is European Union decides where that money needs to be spend in UK. People are not happy with this as they think their government can use this money for better purposes like education and health care. What about Big Business Owners? Strangely most big business owners are in favor of Britain staying in the EU. Why? Because it makes it easier for them to move money, people and products around the world especially the European Union which consists of very wealthy and highly educated youth who can be recruited for job from 28 member countries. If Britain exits the EU then the government may change the rules of recruiting people from other European countries and giving preferences to people of their own country so this can create a huge problem as far as human resource is concerned. When will the voting be held and results declared? A referendum is being held on Thursday, 23 June 2016, to decide whether Britain should leave or remain in the European Union. Anyone who is above 18 is eligible to vote. Whichever side gets more than 50% of votes, that side will be declared the winner and the British government will go that way. The final results can be known at around 4 am Britain time. Which means 4+4.3 = 8.30 am India time on Friday, 24 June 2016 – just before our market opens for trading. 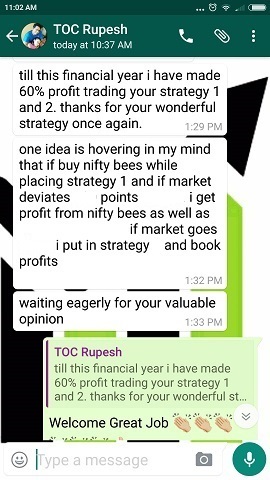 What will happen to Nifty? It’s obvious whatever has to happen it will already happen before the markets open for trading. So either Nifty will open Gap down or up. If the results are “Yes” – it means Britain will leave the European Union and it will be a big jolt to the markets around the world. Not a good news – Gap Down Opening. If the results are “No” – it means Britain will stay with the European Union and it will be a big thumbs up to the markets around the world. A very good news – Gap Up Opening – though not very high opening since technically only fear will go everything else remains same. So what you can trade? Remember we are properly hedged so our tension is ZERO. Let speculators do whatever they want – over a long time they will never win – we will. Lets see what will happen to VIX first? Today India VIX closed at 18.18, 5.33% up than previous close. This was well known that VIX will be very high today as results will be known only on Friday. I think VIX will slightly increase tomorrow as well, and will start decreasing from Friday onward. So go for strategy 1 tomorrow. We are least bothered about direction – that’s the headache of speculators not us. Remember they are gambling we are not – we are trading and trading properly. How many gamblers in this world have made a great fortune? None. Let them travel that path – we won’t. VIX will drop and we will start making profits soon. But do follow rules of Strategy 1 – do not alter profit booking or taking the stop loss rules. For every trading it remains same. If you are already in Strategy 1 – I suggest close it tomorrow whatever profit you get and enter into a new and better looking Strategy 1. Traders willing to take more risk can also try the Directional strategy of my course. Some people asked me if they can try Long Strangle. Remember VIX is high so pricing of options is very high. So you have to take a huge risk to make small money. But on Friday VIX will fall so gap opening will still not benefit you much. And moreover you will not be able to sleep well on Thursday night – is that the correct way of making money? If it does not stays with EU – VIX falls and Nifty opens Gap down: very small profit depending on how far it opens gap down. So I give 25%. Risk reward is 75% loss and 25% profit. Not good. But the choice is yours. Do whatever you want to do. Unlimited risk! Really are you willing to trade unlimited risk to make limited money? If you win may be you will make a few thousand rupees but if you lose it will make you down by lakhs. So avoid it. Please understand that its much better to make small money but without tension and stress rather try to make too much money with stress and fail and in few years and lose lakhs. Results? Time lost, money lost, Ego got hurt and health also degraded. 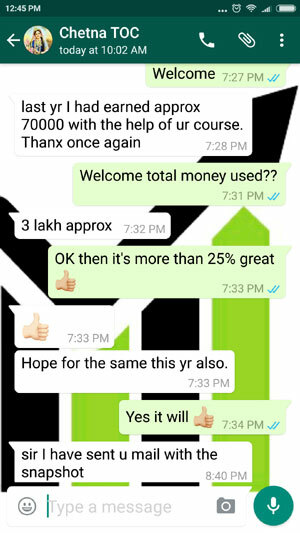 I have been trading in equity cash with the help of advisory. 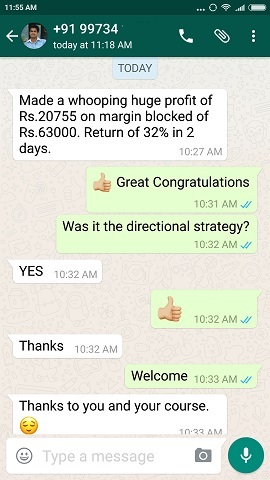 Last month I have put into loss of Rs.250000/- ( intraday ) actually I want to quit the trading but again as per the advice of the advisory to recover my losses I again traded in intraday.This month again I lost Rs.100000/- I dont know what to do, My all hard earned savings have gone, Please advise. Raghunath, I have told this many times it is knowledge, hard work, patience and time that can generate wealth for you. Do doctors take tips from someone when a critical case comes to them to save a life? Or its their knowledge and work experience that saves a life? Why should Gods give money to someone who wants to make more money than Doctors without working hard not even 10% of hard work the highest paid professionals do? Learn from your experience and start working hard. Thanks sir, waiting for the same article. I am in strategy1 with 8200 base. Mayur, great nice to know. Its much better to make small money but without tension and stress rather try to make too much money with stress and failures. But do follow rules of Strategy 1 – do not alter profit booking or talking the stop loss rules. But do follow rules of Strategy 1 – do not alter profit booking or taking the stop loss rules. PS : As usual a sane an advice ahead of a big event. Shaw, you said that VIX will fall, but VIX high 18%. 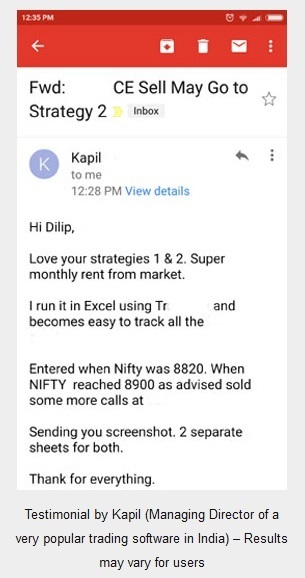 Ravinder that is because of HUGE fall in Nifty and traders panicked. Speculators may have lost lakhs today but hedged conservative traders would be least bothered. And I said VIX will start falling after the event. So it will take some time. Let the markets stabilize VIX will start falling. Sir, after event is over Vix is not falling? Mayur please see the reply given to Ravinder singh sandhu. Do not worry it will fall. I never predict markets or VIX for one day. Its always medium term. Thanks. I got it as panic increased Vix rises,also when nifty fall Vix rises,now onwards it will start falling as event is over and strategy1 will be in profit in few days.